Garbage Concern Welfare Society (GCWS) is among the very few NGOs in Mumbai working in the environment conservation space. GCWS promotes Sustainable Environment Management through non formal education. CGWAS focuses on environmental training, linking environment and livelihood for the benefit of urban poor to help ensure employment opportunities for them. The organization’s teaching pattern goes beyond classrooms/boardrooms to the grassroots. The training sessions and workshops are conducted in the slums of Mumbai. Through its various programmes, GCWS has reached out 200,000 beneficiaries in FY13. The organization with its exceptional objectives has attracted several volunteers to come forward to participate in CGWS’s initiatives. The organization is presently seeking support from corporates and strategic partners to scale up their efforts in reaching out to people in other parts of Maharashtra. Total Income: During FY13, GCWS witnessed a sharp increase in its total income by 68% with an income of Rs2.3mn in FY13 over Rs1.4mn in FY12. The organization’s strategic decision to realign its focus on selling home grown recycled products and ‘Gift a Plant’ campaign led to an increase in income from sales. Sales contributed to nearly 50% of total income in FY13, a trend seen in FY10 and FY11. Other major sources of FY13 income were Individual Donations (33%) and Corporate Sources (13%) (Refer fig. 1). In FY12, GCWS received financial support from Vodafone Essar Limited to implement Project Resolve (CSR initiative of Vodafone) supporting Go-Green concept; thus increasing share of income from corporate sources in that year. 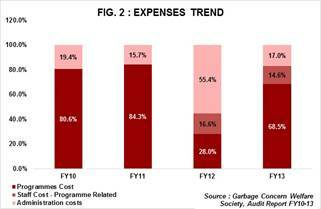 Other expenses/overall administration cost dropped from 54% in FY12 (high due to a realignment process and probably inclusive of fund raising costs) to 16% in FY13. The drop can be attributed to significant decline in overhead costs (47% in FY12 v/s 12% in FY13) and a marginal drop in fund raising, travel expenses and other expenses in FY13. Trust Corpus, General Funds & Other Liabilities: The NGO has maintained a very small corpus of Rs35,000 only since FY10. The surplus generated between FY10-12 is adjusted against accumulated deficits prior to FY10. During FY13, the NGO repaid long term loan availed from its trustees suggesting an improved financial position. Fixed Assets, Investments & Current Assets: Given the nature of its operations, GCWS has an asset light balance sheet with no fixed assets. Current Assets include stock of perishable items like waste produce, manure, plants etc., and a small amount of receivables. Liquid cash maintained at the end of FY13 was to the tune of Rs43,000. 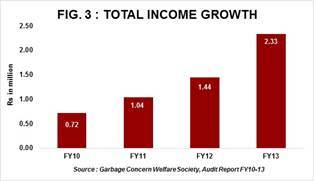 Income Growth Rate: GCWS’s total income grew at an impressive 4-Year CAGR of 48% for the period FY10-FY13. The major influencing factor is the substantial increase in income generated by selling home grown recycled products (paper bags, pouches). 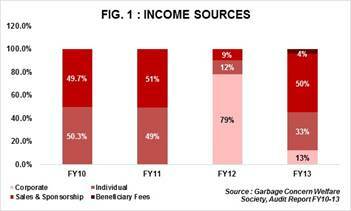 High Self Sufficiency Ratio: The organization’s self-sufficiency ratio improved from 21% in FY12 to 86% in FY13. This is owing to increase in donations and better control of funds received in FY13. Self-sufficiency ratio indicates ability of an organization to meets its expenses from its own funds. Strategic Tie-Ups: GCWS implements its projects in alliance with corporate/colleges. With its presence in niche area of social work, GCWS has received positive support from individual as well as corporate partners. GCWS has implemented projects in the past with Vodafone and college students. Its ongoing negotiations with other corporates will fuel GCWS growth in years to come. Inadequate Funds: NGO’s slow fund raising process limits their ability to make an even a larger impact through their programmes. As the NGO has limited funds, the organization is not able to induct a team that would have otherwise helped the organization grow organically. The Board is composed of seven members having rich experience in the field of social work. The Board meets every two months. The NGO is a member of the National CSR hub at Tata Institute of Social Science. It is registered with GuideStar India, United Way and Samhita. The registration with Credibility Alliance and Give India is in process.